RADIO ŠTUDENT is a non-profit, urban community (culturally & socially differentiated) radio-station established by the Student organization Ljubljana on the 9th of May in 1969 and is one of the oldest community radio stations in Europe. 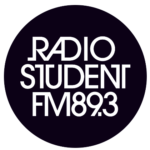 The primary objectives of Radio Študent are to promote the interests of different social and cultural minorities, as well as the interests of the student community. By paying attention to more complex and generally discriminated topics it also educates its own listeners. Since its very beginnings, Radio Študent has promoted values such as tolerance, respect for differences, freedom, truth, solidarity, consistent asserting of human rights etc. Radio Študent also plays an important role in providing informal trainings in journalism for students and youth. Each year we train more than 50 young journalists in different fields (socio-political, cultural, music, scientific), radio announcers and radio sound technicians. Throughout the history of Slovene radio broadcasting Radio Študent stands out as the foremost presenter and critical evaluator of actual global music events with its characteristic form of music criticism, heartfelt and absorbed presentation of edgy, marginalised and socially provocative music from across the globe ranging from all alternative forms of rock, jazz and improvised music, avant-garde and folk music, experimental music, contemporary DJ and electrophonic music. delivering news from the word of science: science news, interviews with scientists, broadcasts on natural sciences.